Today I am going to share recipe of one of my favourite dessert , which is very easy to prepare and takes less time to get ready . I am talking of Bread Halwa–an Indian dessert . In India we see variety of sweet dishes and Dessert , each state has its own list of sweets and desserts . Halwa is common every where , one can enjoy various types of halwas in winter season like carrot Halwa , Beet root halwa , channa dal halwa , egg halwa popularly known as Andey ka Halwa . 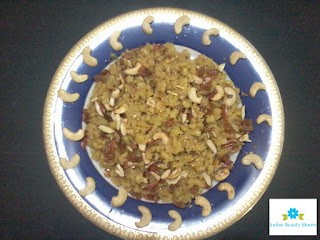 This bread Halwa is a type of Andey ka halwa prepared from bread and eggs . Today I have prepared this andey ka halwa in a sugar free way , instead of using sugar , one can use Sugar free Natura (powder) to prepare this dish . 5.Dry fruits ( of your choice ) — 1 small bowl , finely chopped. I have used cashew , almonds and raisins for this recipe . 1.Cut the edges of bread slices and remove the brown part . 2.Crumble the bread to make fine powder . 3.In a separate bowl whisk eggs till fluffy . 4.Add whisked eggs to crumbled bread and mix well. 5.Heat ghee in a thick bottomed pan or kadahi , fry dry fruits on medium flame taking care not to burn them , then take them out and keep aside . 6.In the same pan add bread and eggs mixture and cook on a medium flame .Stir continuously so as not to get clumps . 7.Fry this for around 10 -15 minutes till its cooked properly and the mixture comes in a granular form . 8.Add sugar free natura and mix properly and cook for 3-4 minutes more , then switch off the gas stove . 9.Dish it out in a serving dish and garnish with fried dry fruits . 1. Its very nutritious , as it contains eggs , dry fruits and ghee so good for small children . 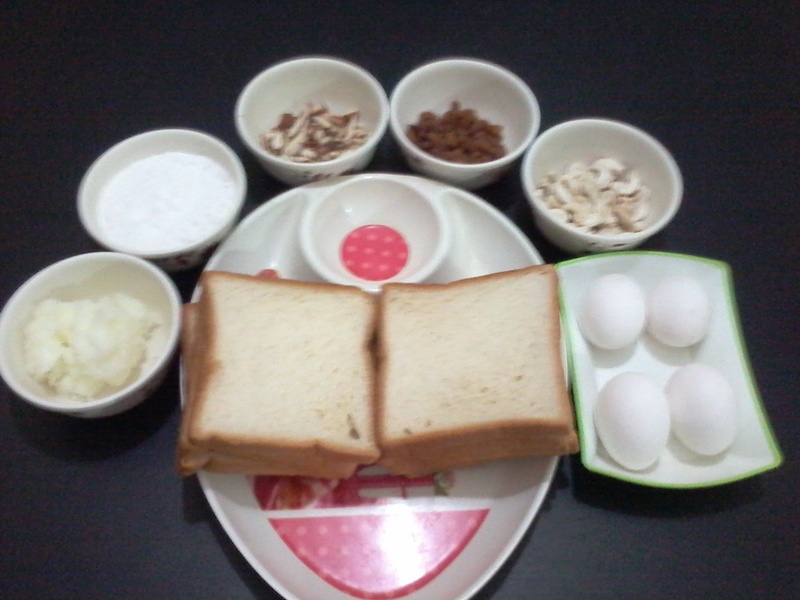 2.Its very easy to prepare , the recipe is very simple can be prepared by any one. 3. It takes less time to prepare as compared to other Halwa’s .I have prepared various types of halwa’s like Gajar ka halwa , channe ka halwa , Andey ka halwa ( with eggs & milk) , all of them consumes lots of time , more than an hour and one really gets tired , But this Halwa can be prepared with in 20 -30 minutes . Sugar Free Natura is a substitute for sugar , good for people who are calorie conscious and for Diabetic patients also who want to enjoy sweet dishes but cannot eat sweet dishes prepared with sugar .Sugar Free Natura is derived from Sucralose which is not recognised by body as sugar or carbohydrate and so can be safely taken by Diabetic patients .It does not effects blood glucose level and is calorie free. I am writing this post in association with Sugar Free Natura DESSERT CHALLENGE . Where one has to recreate our favourite dessert recipe with Sugar Free Natura . Chef Sanjeev Kapoor is the brand ambassador of Sugar Free Natura , One can watch various recipes of Indian sweets prepared from Sugar Free Natura on you tube or Khana Khazana done by Sanjeev Kapoor . Very easy & yummy recipe ! Your halwa looks yummy. Adding sugar free is really good for diabetics.